College can be stressful, exhausting and sometimes lonely. Students often find themselves wondering if they should get a dog to help them cope. A dog can be a wonderful new addition to your life, but there are many factors you should take into consideration before taking on this responsibility. Dogs take a lot of time and dedication. Keep in mind that a dog will depend on you for his livelihood, even more than you will depend on him for happiness. Ren Yin, a student at U of L and owner of two pups, agreed on the importance of having enough time. Money is another huge factor in owning man’s best friend. “Having a dog gets expensive. An annual vet visit in Louisville runs around $100, and even more for my older dog who has some health issues,” said Yin. It is essential to budget not only for expected and unexpected trips to the vet, but also quality food, treats and grooming or boarding if needed. It is best to consult with your veterinarian on what diet and extra care your individual pet needs to thrive. If you come to the decision that you have the time and financial stability to care for a dog, owning one while in college can be one of the most rewarding experiences you can have during your college career. Yes, there are the negatives of walking in the cold and cleaning up after them, but these are far outweighed by the benefits. Being a dog owner keeps you fit, too. “Having to get her exercise gets me to exercise too. I love taking her on walks and it’s helped me explore Louisville a bit,” said Bardgett. Louisville is a very walk-friendly city, in addition to being dog-friendly. The Louisville Dog Run Association also offers a variety of dog parks for your pup to romp across Jefferson County. A yearlong membership can be purchased at any Feeder’s Supply location for $30. If you decide that you aren’t ready to take on the responsibility of becoming a dog owner, student Kelly Heishman suggests volunteering at the local shelter. 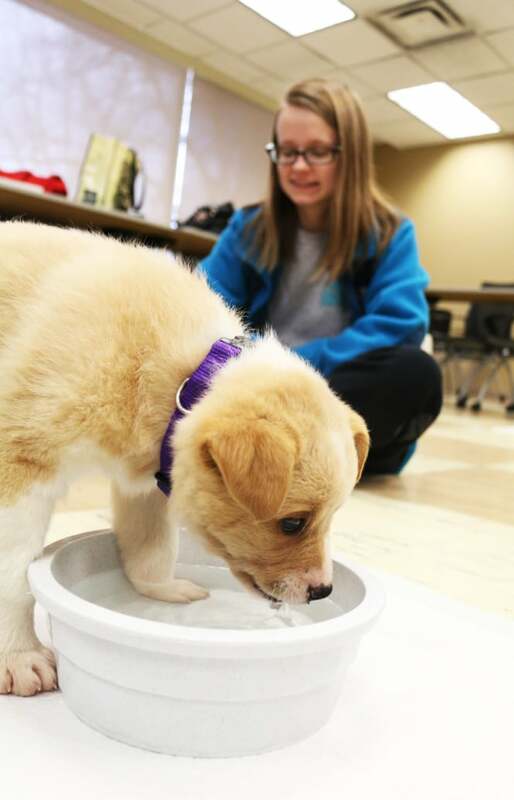 “Play with the puppies who need the most love,” Heishman said. Who knows? Maybe when you are ready to take on the challenge, you will be able to give one of the shelter dogs a forever home.